So, the rather fabulous image seen below will grace the cover of each and every copy of Bravely Default: For the Sequel sold in Japan starting on Dec. 5. 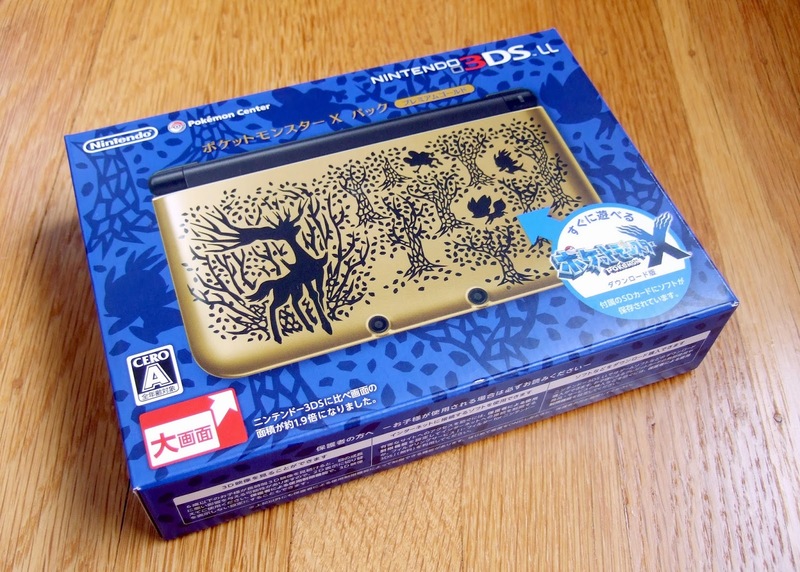 As far as I can tell, the Australian and European versions of this beautiful 3DS RPG (which will hit store shelves on Dec. 7 and Dec. 6, respectively) will sport the same box art--with the "For the Sequel" bit removed, of course. 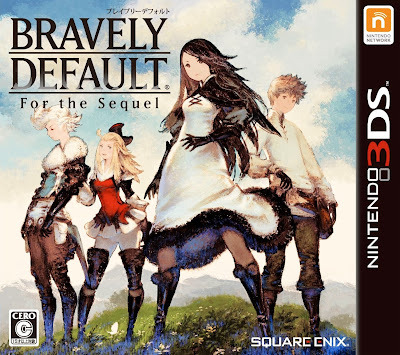 Does this mean we can expect it to be used once again when Bravely Default finally makes its way to North America sometime between Jan. 1 and Mar. 31? I sure hope so. I know it's not the most original of compositions, but it's colorful and bright and brings to mind Final Fantasy: The 4 Heroes of Light, so I'm pretty fond of it despite the fact that it's far from unique. 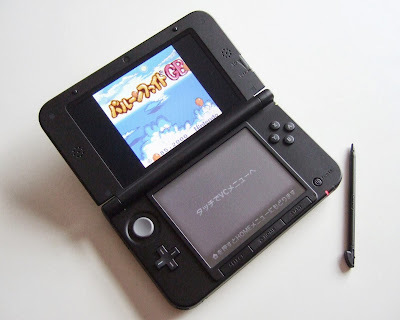 Those of you who read this post the other day probably noticed the bit at the end about how I've already put some time into both Pokémon X and Sayonara Umihara Kawase since my Pokémon Center 3DS LL arrived on my doorstep. Would you believe I've played more of Sayonara Umihara Kawase than I have Pokémon X? Well, even if you don't believe it, it's the truth. * If you're looking for a "looker," you'd better look somewhere else--That's a long (and rather stupid, I have to admit) way of warning folks that this game is pretty darn ugly. And this is coming from a guy who generally doesn't care how attractive or unattractive a game is. I think my negativity in this case stems from the fact that I like the visuals of this game's two predecessors. 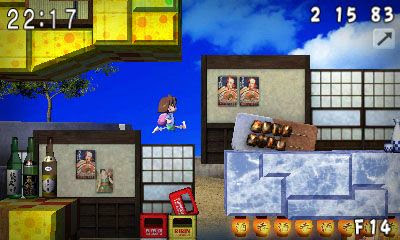 The good news here is that if you're anything like me, your hatred of Sayonara's graphics will soften fairly quickly (due to your enjoyment of the rest of the game, of course). 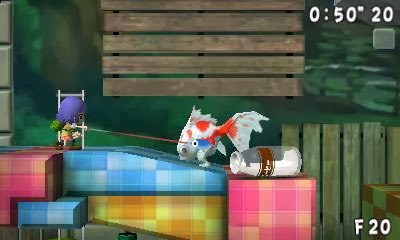 * It may look all cute and cuddly (if also kind of ugly), but this game will kick the crap out of you--Granted, that should come as little surprise to anyone who's played, or even heard of, the previous entries in this strangely titled series. If you're an Umihara Kawase virgin, though, you may be shocked to discover just how difficult this version can be. My suggestion: just go with it. Embrace the fact that dying in this game is like gaining "1-ups" in a New Super Mario Bros. title and you'll enjoy it a whole lot more, I say. 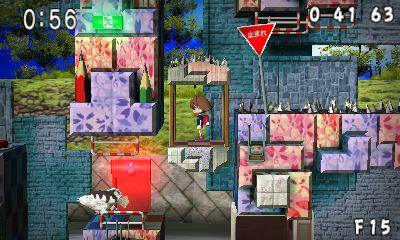 * Despite all of the above, I'm still having a blast with Sayonara--While playing this game's fifth stage the other day, I must have died about 15 times (if not 20). Sometimes I died after nearly making it to the stage's exit, sometimes I died just a few steps from its start point. After each and every death, I let out a surprisingly hearty guffaw given the situation at hand. To me, that last bit is all you really need to know about Sayonara Umihara Kawase. Yes, it makes some of Ubisoft's shovelware look like masterpieces in the graphics department (OK, so that's probably going too far), it can be awkward to control and it's often tougher than a two-dollar steak, but it's also totally unique and an awful lot of fun. 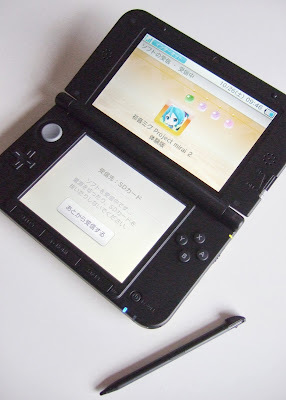 As such, at the moment I'd highly recommend it to 3DS owners who yearn for something new and different and who aren't afraid of a stiff challenge--especially should it arrive on the eShop carrying a $20 price tag, as has been rumored. 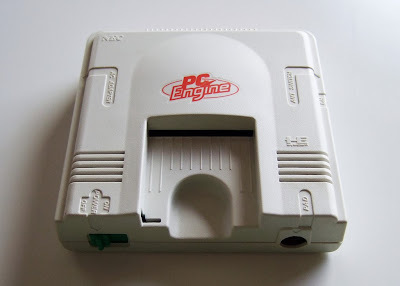 Happy 26th anniversary, PC Engine, and ever-so-slightly belated 25th anniversary, Mega Drive! 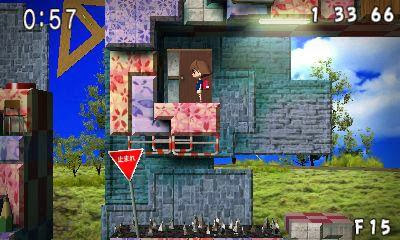 I was all set to publish a post about something else this morning--such as early impressions of Sayonara Umihara Kawase, which is set to hit the North American 3DS eShop early next year as Yumi's Odd Odyssey--but all that went out the window as soon as I realized that today is the 26th anniversary of the release of one of my all-time favorite consoles, the NEC PC Engine. 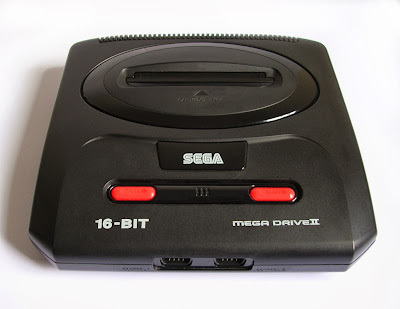 Sadly, I've never owned an actual Mega Drive system (or any Mega Drive games, I believe). Oh, I've had a Genesis for some time now, but it's really not the same thing, is it? Anyway, a Japanese Mega Drive 2 (or maybe a Mega Jet?) 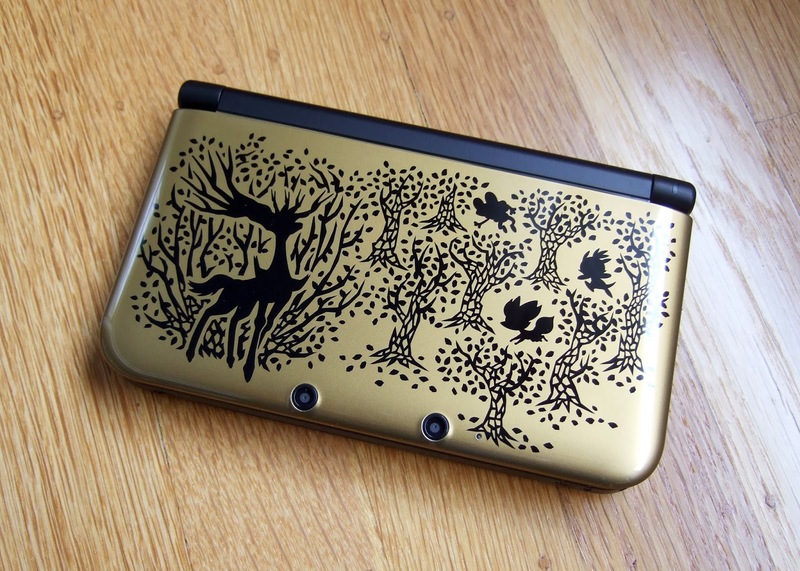 is on my "to buy" list--along with a few other systems and about a thousand games--so hopefully I'll acquire one before my time is up. I have owned a PC Engine, though--as well as a Core Grafx II, a Super CD-ROM2, a TurboGrafx-16 (also with CD attachment) and a TurboDuo. You'd think that would be enough to scratch anyone's PC Engine itch, but nope--I want more. Specifically, I want a PC Engine LT. Thankfully, I'm not (yet) willing to blow $1,000 or so on a single console. Anyway, enough about me and my insane desires. This post is supposed to celebrate the existence of both the PC Engine and Mega Drive. So, here's a virtual tip of the hat to NEC and Sega for producing a pair of consoles that continue to tickle the fancy of tasteful gamers the world over. How did I spend my weekend? 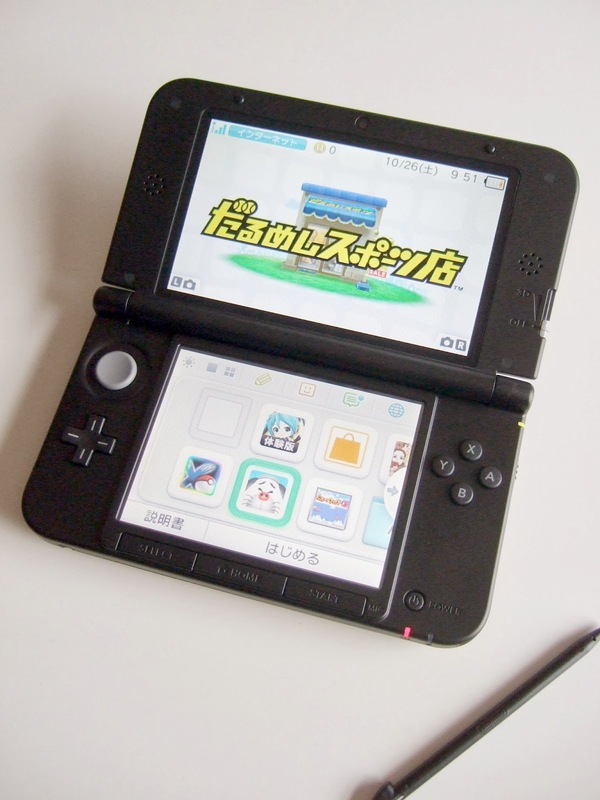 Well, besides doing a bit of catch-up work and playing some ping pong with my husband, I spent it setting up my shiny (literally) new 3DS LL. OK, so I did more than just set it up. I also downloaded a few demos as well as an actual game or two. 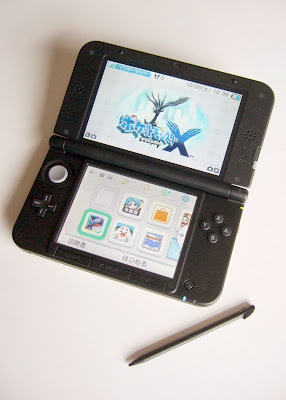 Oh, and I played a good number of minutes of the game that was included with this sparkly handheld, Pokémon X.
I'll share my initial thoughts on Pokémon X in a couple of days. In this post, though, I want to focus on the hardware and its packaging--both of which can be seen in the following photo. I have to say, I'm pretty fond of the front of this system's packaging. OK, so it could be more dramatic--you know, covered in gold leaf or something--but it's still very much a looker in its current form (in my opinion, of course). As for its backside: well, it's, uh, informative? Utilitarian is another word I'd use to describe it. Regardless, it's probably safe to say I'm not going to while away the hours staring at this portion of the handheld's box. 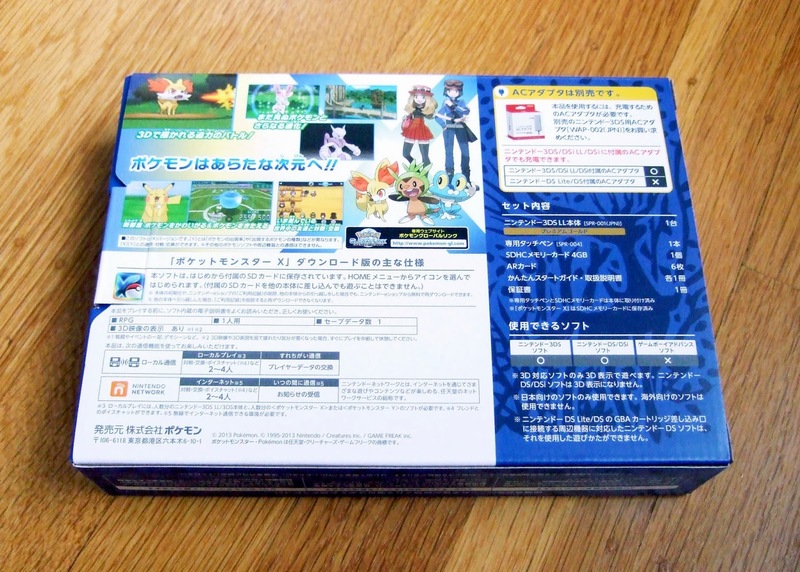 One thing that disappoints me about the Pokémon Center 3DS LL's packaging is that it displays little of the charm that's plastered all over the system itself. For example, why don't the end flaps, one of which can be seen below, feature a few playful silhouettes of frolicking Pokémon? 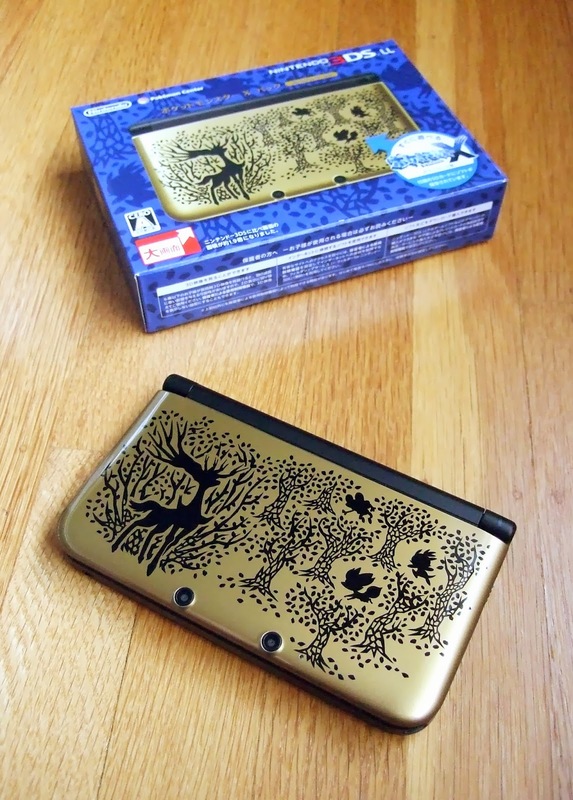 Thankfully, there are plenty of silhouettes of frolicking Pokémon on the actual hardware--which is far more vibrant (and shiny) than it appears in the following snapshot. 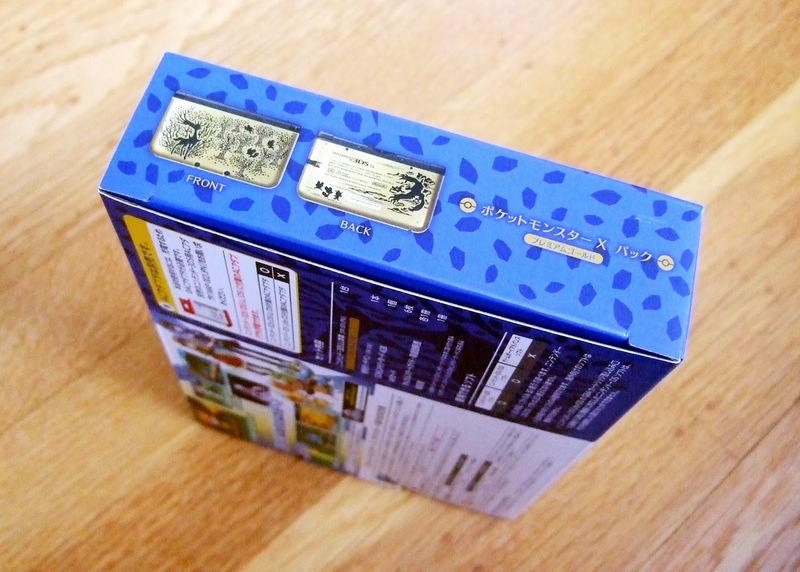 The back of the hardware is nice, too, although it doesn't quite match the splendor of its counterpart around the corner (thanks in large part to the annoying block of text that likely has to be featured on all such devices). Finally, here's a shot of its interior. Yep, it's black. 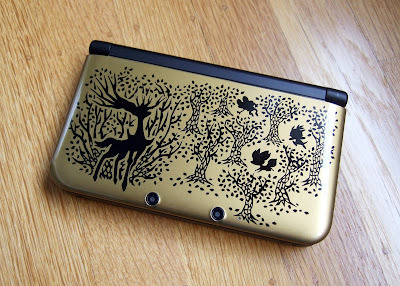 In fact, this part of the system looks just like every other 3DS LL or XL you've ever laid eyes on--there are no gold accents or trim or even silhouettes of frolicking Pokémon to be found. Damn it. Actually, I'm completely OK with that, as such accents likely would be a distraction in the end--and, really, who needs that when you've got awesome games like Pokémon X, Sayonara Umihara Kawase and Taiko no Tatsujin: Chibi Dragon to Fushigina Orb to play? 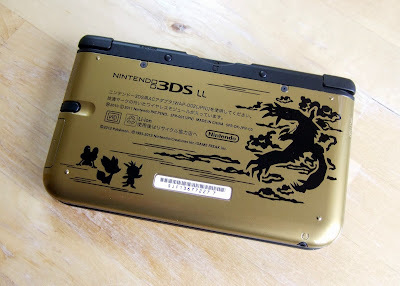 Who wants a Charizard-branded 3DS LL when you can have a Charizard GameBoy instead? 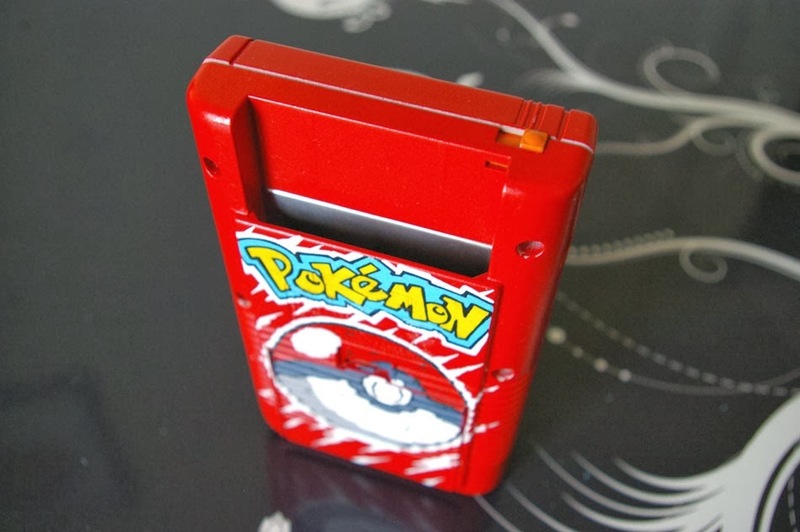 OK, so it's extremely possible I'm alone when it comes to preferring the custom-painted system below to the official one that was released in Japan late last year. Of course, I've always appreciated dramatic-looking consoles, and this Charizard-branded GameBoy certainly fits that bill. 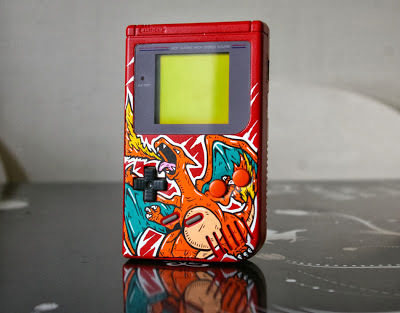 As for who's responsible for this colorful concoction, that would be artist and blogger Oskunk, of custom-art.blogspot.fr. The backside of this particular GameBoy is nearly as beautiful as its front, in my opinion--although I think it would look even better with copy of Pokémon Red stuck into it, don't you think?